Now, I am all for inexpensive products that work just as well as the expensive ones but, for this product, there is no match. 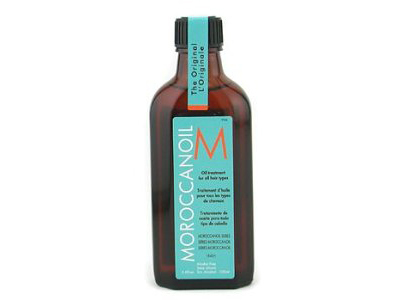 The Moroccanoil brand hair oil treatment is an oil that you can use on your hair wet or dry to help smooth and give a healthy look. I tried this products a few years back and I was hooked. It then made it’s way into beauty magazines everywhere. I like to pretend I knew the secret of this amazing product before it got to celebrities. I use a nickel size amount on my mid-back length hair before I blowdry/roughdry (I rarely blowdry my hair completely) to help smooth my wavy hair and semi-dry ends. Then after I’ll put an addition tiny bit through my ends. It’s hard to really pinpoint why this product is so great because I have been using it for a few years now but I can swear on days that I don’t use it my hair feels extra dry, flat, and the color looks dull. This is an all around miracle product that I think works for all hair types (just use sparingly on thin/fine hair). I suggest not putting this in your bangs or near the roots because it is indeed an oil, however some days I put a lot through my ends and it doesn’t appear greasy at all. You can purchase it at salon’s or online on websites like ebay and amazon. It is a pricey product but I feel it’s worth every penny.